• The Dalstrong Shogun Series X chef knife is painstakingly crafted over 60 days using the highest quality materials, it is both a razor-sharp kitchen powerhouse and artistic statement in premium design and workmanship...unrivaled in performance, beauty and value. Chef's Knife Perfection: A Dalstrong culinary revolution combining outstanding and award-winning craftsmanship, cutting-edge breakthrough technology, awe-inspiring design, and the absolute best materials available. Peak performance never looked so good to you or your wallet. 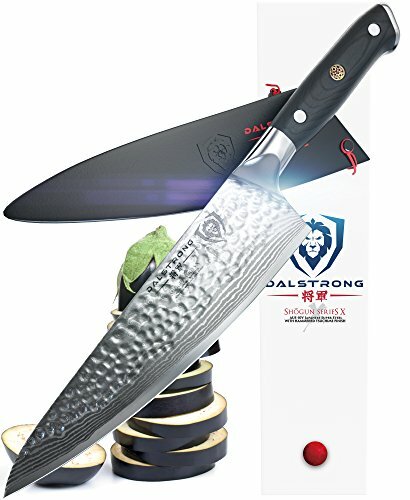 Dalstrong Power: This chef knife features an ultra sharp AUS-10V Vacuum Heat Treated Japanese super steel cutting core at 62+ Rockwell hardness: extraordinary performance and edge retention. 66 layers of premium high-carbon stainless steel layers ensure exceptional strength, durability and stain resistance. Perfectly balanced. Dalstrong's stunning 'tsunami-rose' genuine Damascus layers. A Chef's Knife Engineered to Perfection: Ultra-premium G-10 handle is military grade with life-long durability. Hand polished, the ergonomic handle shape is engineered for superior control, agility and comfort while the blade's spine is made smooth for a natural 'pinch grip'. The 55mm blade width allows for improved knuckle clearance. Color: Black G10 handle, nitrogen cooled AUS-10V w/vacuum heat treatment, damascus 66-layers, Honbazuke sharpening, full tang, premium packaging, lifetime warranty, Dalstrong support.